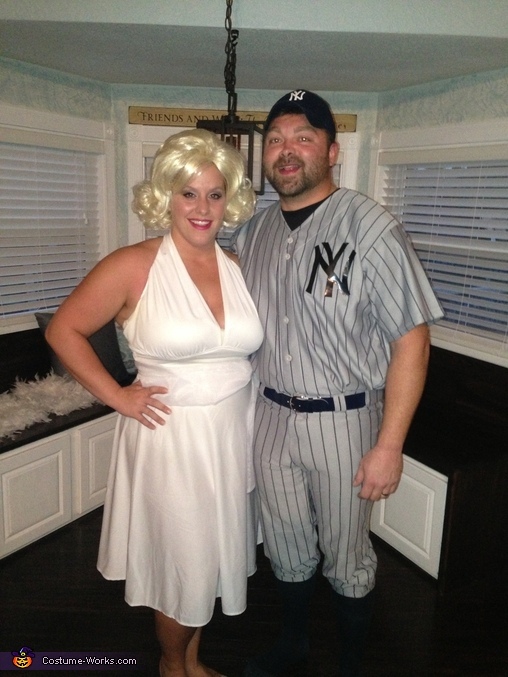 My daughter, Promise as Marilyn and her husband, Matt as joe DiMaggio are wearing the costumes. The idea was prompted by my daughters infatuation of all things Marilyn Monroe. Her dress was purchased and she filled it out quite naturally. Add the wig then follow a tutorial on how to do the make up and she was set. We ordered a baseball uniform for Joe. I then made the New York Yankee logo from duct tape and added to the front. We ironed on his name across the back with his number added made from, you guessed it, duct tape. She proceeded to do the "snap and bend " from the movie Totally Clueless and he slid across the floor, baseball style, and ended up at her feet, fanning her skirt... first prize at the Elks lodge ! Where did you get the joe DiMaggio costume?